An innovation in the world of Wild West crime was made on October 6, 1866 when the Reno gang committed the first robbery ever made on a moving train. (There was an earlier one committed by guerrilla soldiers in 1865, but it’s thought to have taken place while the train was stopped). Robbing trains en route turned into a very lucrative venture, and many outlaws made it their specialty. Immediately following the Civil War, jobs were scarce which led to heightened lawlessness and criminal activity. A proliferation of outlaw gangs and desperados sprang up as a result, especially in rural communities. One of the first – and most notorious – of these outlaw brotherhoods was the Reno gang in Seymour Indiana. The primary members were four siblings: Frank, John, Simeon and William Reno. Once the train was out of the station, the trio headed for the express car, and held the messenger at gunpoint while they made off with at least $12,000 (about $188,000 today). 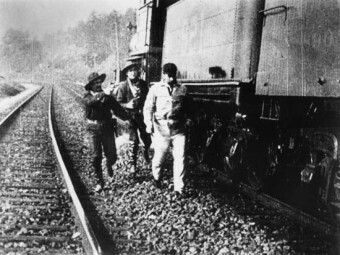 The three men also pushed a large safe from the train where other members of the gang were waiting, but they had to abandon it when a posse showed up. Ten of the gang members were apprehended and lynched, but the brothers escaped. The Reno brothers robbed their fourth train on May 22, 1868 in Marshfield, Indiana. As the train was exiting the depot, 12 members of the Reno gang overpowered the engineer and disconnected the passenger cars. As the engine sped away, they broke into the express car and threw the messenger off the train to his death. The robbery made the gang around $96,000 (about $1.7 million today) and attracted national attention. The railroad company hired the Pinkerton National Detective Agency to pursue the robbers, but they split up and scattered all over the Midwest. In December of 1868, Pinkerton’s caught up with Frank, William, and Simeon Reno. They were imprisoned, but were dragged from the jail by an angry mob and hanged. The only surviving brother, John, was also eventually apprehended, and did time in the Missouri State prison. He later died in 1895 at his home in Seymour Indiana.